Thomas Herbert Grundy was born in January 1888 in St Helens. He was the son of Peter and Ruth Grundy. By 1911 the family of 6 children, their parents and 2 servants were living at Carlton Lodge, Orchard Dene, View Road, Rainhill. 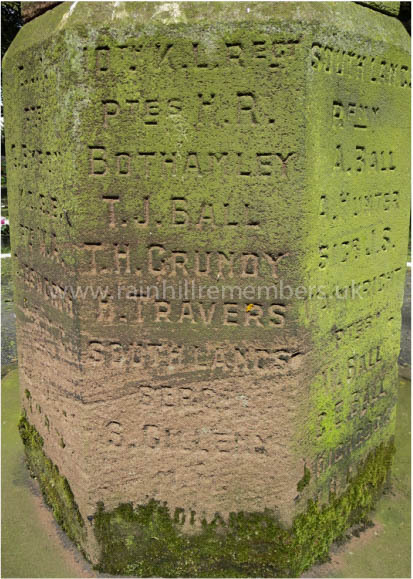 Thomas was an Auctioneer’s Surveyor at the Land Valuation Department at Burnley. His father was a St Helens J.P. It was in Burnley that he enlisted as a Private and joined the 5th Battalion Kings (Liverpool Scottish) Regiment becoming rifleman, number 5991. Thomas fought in France and Flanders and was about to be given a commission but volunteered for the Front before his promotion was gazetted .He was killed in action on 8th August 1916 and is buried and commemorated at Thiepval Memorial. "News has been received of the death in action on 8th August of Private Thomas H. Grundy of the Liverpool Scottish, a kilted Regiment of the King's Liverpool. Mr. Grundy, who was awaiting his commission, all his papers being in order, was for three and a half years in the Government Land Valuation Offices at Burnley and joined the Army last December, being in training at Blackpool till about Whitsuntide this year. He had only been out about seven weeks when he was killed by a bullet. Private Grundy was 28 years of age, and the eldest son of Mr. Peter Grundy, of Rainhill, near Liverpool, a Justice of the Peace for St. Helens. Serving his articles with Mr. Wm. Thompson of Cook Street, Liverpool. Mr T.H. Grundy came to Burnley early in 1913. Previous to coming he was a member of the Liverpool Rugby Club, and was a good tennis player. 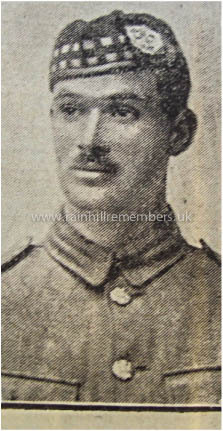 On coming to Burnley he attached himself to the Glen View Golf Club, and is the second member of the club to fall in the war". Medal Entitlement: - British War Medal, Victory Medal. The name of T.H. 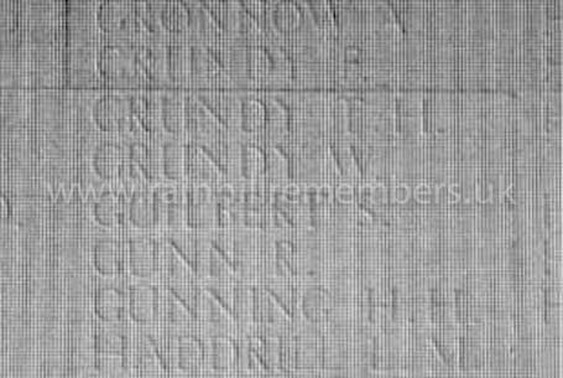 Grundy inscribed on Thiepval Memorial. St Ann's Churchyard WWI Memorial where T.H. 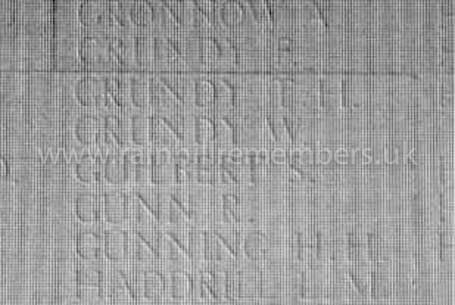 Grundy's name is inscribed under the heading of the 10th King's Liverpool Regiment.